In order to read and write to the TV’s panel EEPROM, you’ll need an I2C master capable device. In this guide I’ll use an Arduino board, which is pretty cheap and has wide support base and availability. You can use any I2C master device, but in that case you’re on your own regarding the programming of the device. 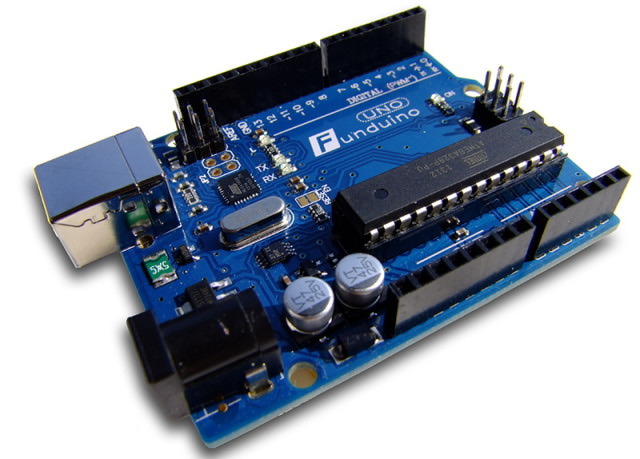 There are several Arduino boards available. I will be using an Arduino Uno Rev.3 I got from eBay. Actually mine is a Chinese compatible board Funduino UNO based on Arduino UNO R3 documentation but it should make no difference. The board has a USB port that is used to connect to a computer (or even an Android phone or tablet as I will demonstrate later) and is used for programming the device, giving input to the board, reading output from the device, as well as providing the board with 5V power input. However, once the board is programmed, if powered from either the USB port (e.g. USB charger) or power adapter socket (which can take input in 6-20V range), it can function as a standalone device that can be hooked to the TV and do the A-board reset. You should be able to use most of the Arduino boards, the only exception I know of so far is the Mega2560 (more on that in the Disabling internal pull-up resistors on Arduino board section). I myself have a TX-P42GT20 that has around 12000 hours and a really REALLY bad level of blacks. I own a RaspberryPi v2, who allows for i2c communication. It also has 5V and 3.3V power connexions. Should I use the 3.3V instead of the 5V ? If I succeed in restoring the black level, I’ll post a detailed walkthrough with the raspberry pi.